This summer, you may have noticed a significant decrease in actionable alerts. This was due to an improvement made to our Data Science model, allowing us to categorize Safety and Security content associated with your school as either actionable or discussion. 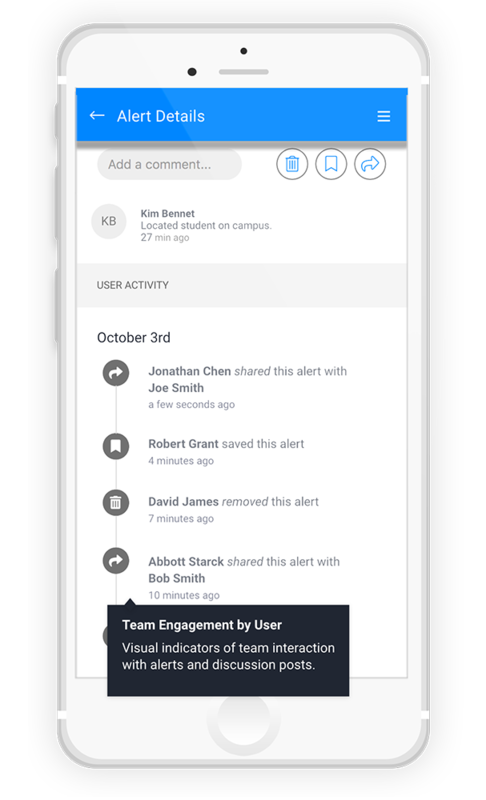 Actionable content associated to your school(s) is filtered into the Alerts tab within the SSI system. Discussion content, on the other hand, is displayed in a new tab, aptly named Discussions. This content is useful for gaining awareness of trending safety-related conversations occurring within your community. 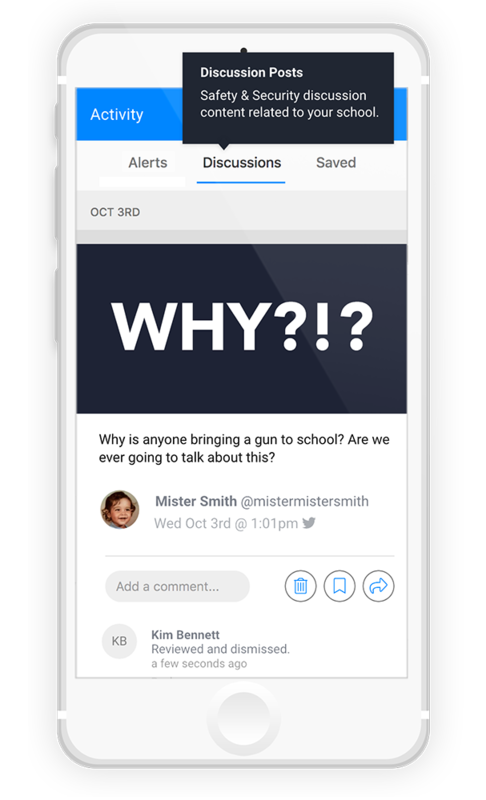 You can now see/save/share/remove/comment on safety and security Discussion content related to your school(s). We’ve had a busy fall so far, designed at making your experience easier and more collaborative. Below is a quick list of what our Engineering team built this past October. This information is available on both the Activity listing and the Details page. 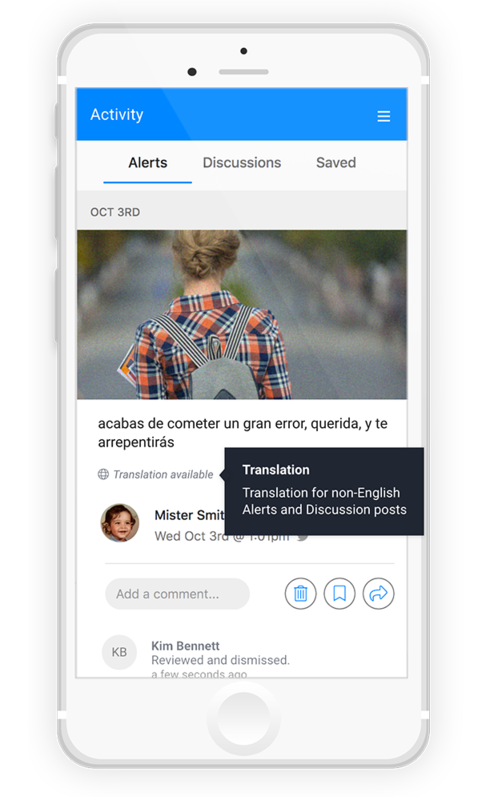 If our system detects non-English content from a social media post, you will now see Translation Available on the Activity Listing, and Show Translation on the Activity Details screen. If the author of a post chooses to share his/her whereabouts while posting, the Social Sentinel application now displays a map to that exact location. However, in practice, we see less than 10% of posts that fit this category because most users do not share their exact location on platforms such as Twitter. 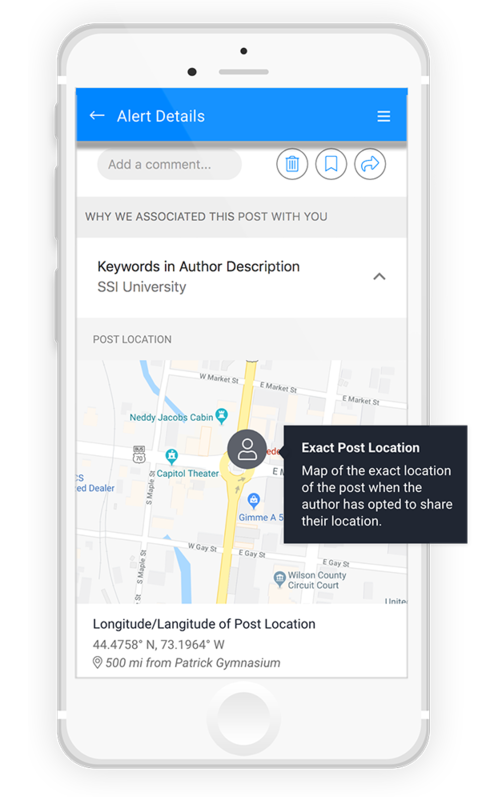 Post Location – The location of the post if the author chose to share their exact location at the time of the post and/or “checked in” to a specific place that matches your school’s location(s). Author Location – The author’s location/hometown field (ex: “Burlington, VT”) matched your school’s location(s). Post Keyword – A specific term or phrase matching your school’s unique criteria was found in the content of the social media post. Author Keyword – A specific term or phrase matching your school’s unique criteria was found in the author’s description/bio. You will see a table on the details screen of the Alert or Discussion post, highlighting the association methods used to link this post to your school. We always try to make Social Sentinel as easy to use as possible. 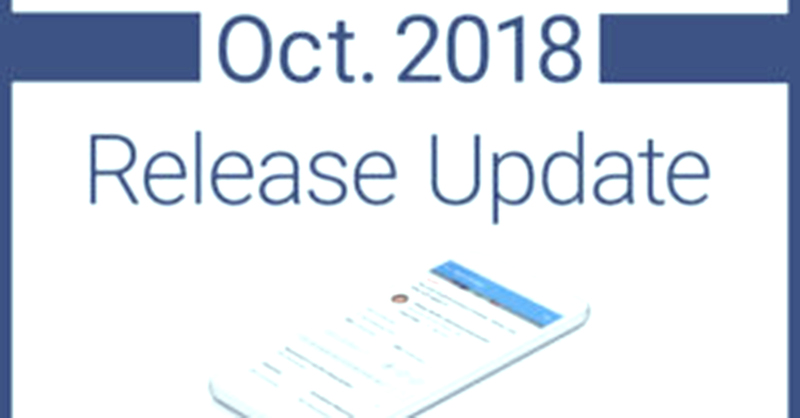 Feel free to share your feedback on these new features, or any suggestions you have for future enhancements with your Client Success Manager. Look for another update next month around this time with even more exciting additions.